Max is right. Poker Night at the Inventory is basically a vehicle for fan service. I can't judge it as a poker game. I had never watched a single game of Texas Hold 'Em before playing this. But as a piece of fan service, it is as concentrated a dose as you can safely imbibe. 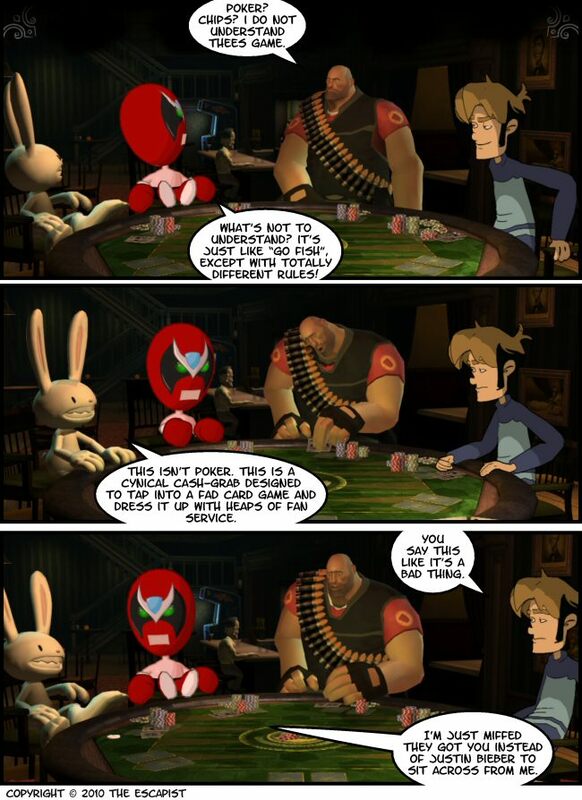 For just five bucks you can see an adventure game character, a web cartoon icon, a team-based shooter character, and a webcomic star all sitting at the table together, joking around and talking about their fictional lives away from the poker table. Up until now I've always read Penny Arcade so that Tycho had the voice of Kelsey Grammer and Gabe had the voice of Steven Blum, so suddenly hearing him voiced was a bit jarring to me. If anyone else imagined voices for them, I'd love to hear who you chose. This is obviously an experiment, so I'm hoping this game is successful enough to achieve regular follow-up titles.